Restaurant 'the bistro' at Novotel Ambassador Gangnam invites you to a special spring family feast 'Family Table Buffet' for your wonderful spring family dining. With a wide-spread 5 day working system, which will be applied to workplaces with over 50 employees as of July 2007, the weekend family dining is now a common step to put all family members together. At the bistro, the weekend family dining features a variety of all new family dishes at affordable prices. 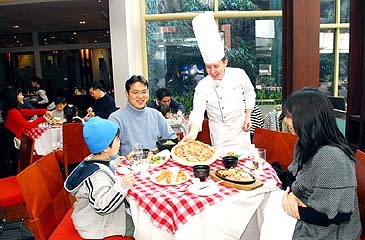 The 39,000 won family table set (for 2 guests) includes fresh salad, soup, spaghetti, pizza, chicken and other kids' favorite dishes and, for any special occasions such as birthday, the restaurant also features a 78,000 won family grill set including beef steak, Mongolian beef, chicken BBQ and other grilled set dishes. A free soft drink is included and no additional charge is required to children. Visit 'the bistro' for your weekend dining with your family and feel the freshest spring through the falls out of the window of your table.